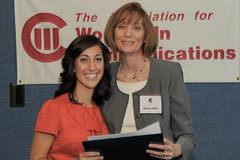 Katherine Cotsonas, a junior at American University with a double major in Broadcast Journalism and International Relations, received the 2010 AWC-DC Matrix Scholarship, sponsored by PRofessional Solutions, LLC. In a long-term arrangement with the DC chapter of the Association for Women in Communications, this is the third year PRofessional Solutions has sponsored the Matrix Scholarship. “We are proud to support the development of future women leaders in our profession,” said PRofessional Solutions Managing Director Melanie Jordan at the May 19 reception at the National Press Club. This entry was posted in AWC-DC, PRofessional Solutions News, Sponsorships and tagged AWC-DC, Katherine Cotsonas, Melanie Jordan, PRofessional Solutions. Bookmark the permalink.